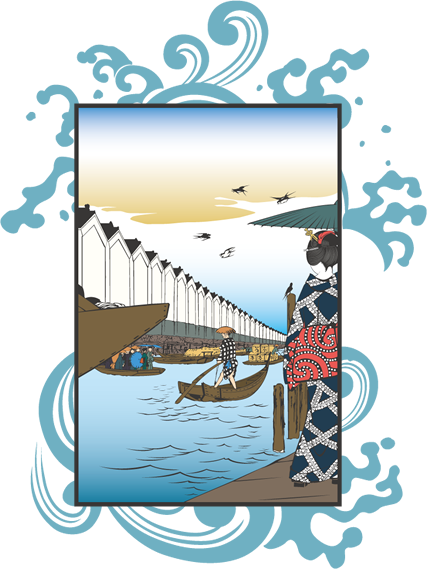 Although there have been some major changes in operation from fishery to pleasure fishing boats, and to Yakatabune boats, Boathouse Hashiya started its very first boat-related business at the end of Meiji era (1868 - 1912). It was born right in this region. We are the 4th generation, and some of our ancestors include a chopstick craftsman (maker) and a teacher of writing and calligraphy at Terakoya (private elementary school in Edo period) in this area prior to getting involved with fishery. Since not many of our customers know “old Hamamatsucho” anymore, I would like to introduce you its interesting history. The waves of redevelopments have surging through Hamamatsucho since 2014. It’s the massive redevelopment of the surrounding area along with rebuilding of the Hamamatsucho World Trade Center Building. However, there haven’t been any changes to the unsatisfactory development condition due to half-finished projects such as unfinished road plans left untouched for a long time. I believe this current condition is causing much inconveniences for both workers and residents. Now I’m going to introduce you to some summaries and extracts from a booklet which contains a discussion between the late Tachibana Ukon (Rakugo storyteller, the originator of Edo-style [yose-style] characters), members of Shogado-jyuku (host of this discussion) and members of Shibahamayoncho-kai (town block association) held at Shiba Daijingu Sanshu Den in 1984. In old days, Shibaura, the seaside region which was broader than the current Shibaura, had many fishermen especially at around the time Ieyasu Tokugawa entered the Tokyo region, these fishermen used Hibi which was a fishing method using bamboo sticks. 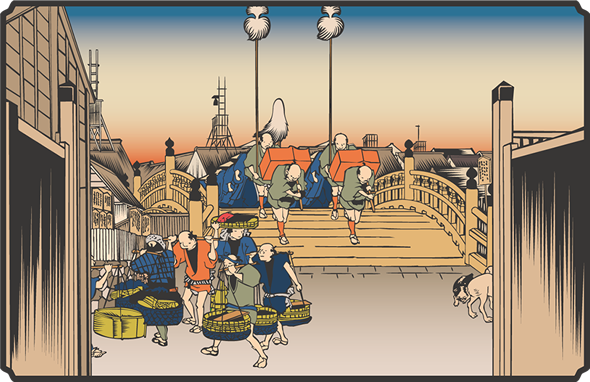 These fishermen had offered sea bream and white bait as gift to Edo Castle since 1626. As a reward, about 33,124 square meter of land was given as a fishing net drying area. People asked the town magistrate to make the land into a residential area for fishermen. In 1634, the town distribution was issued as their request was granted, and the area was named as “Shinmoucho” which means a new net town based on the land used for drying fishing net. Shinmoucho has a waterway running from the ocean through the middle of the town separating into Minami-machi (south district) and Kita-machi (north district). (From Tokyofu written material, Tokyo Geographical History Journal, and Tokyo Annai [Guide of Tokyo]) “Shiba Shinmoucho North” and “Shiba Shinmoucho South” had been written in the family register up until it changed its name to “Shiba Hamamatsucho 4-chome” in 1932. *Shiba Shinmoucho: Vicinity of JR Hamamatsucho station, streets of houses along the railroad on the way to our store. *Minatomachi: The ocean side from Kanasugihashi on Route 15. Rows of houses along the old river right where we locate. *Shiba Hamamatsucho 4-chome: The side of Shinbashi from Kanasugibashi, from the Hamamatsucho 2-chome intersection to just before the Kanasugibashi intersection. This is a story during the Edo period. People from Nihonbashi or Kanda used to cross the Kanasugibashi bridge when they traveled Tokaido. Even when their family members or friends came to see them off, it was said that they said goodbye on the Kanasugibashi bridge as it was famous for its farewell rhyme. As you cross the Kanasugibashi bridge towards Shinagawa, you come to “Kawaguchicho”. Several magnificent traditional Japanese restaurants such as “Miharashikan”, “Ikesu”, “Shibahama-kan”, “Takeshiba-kan”, etc. that served the freshest live fish in the Edo style were all lined up along the street. However, the lifestyle of the town hidden behind the main street (current Dai-Ichi Keihin) was all about the same. It was the lifestyle of fishermen depending on the weather… We could easily imagine what was like. Especially, it was said that “Shiba Shinmoucho” was one of the top 5 poorest towns in Tokyo at that time. It was the old-fashioned town where the poor helped each other out and got along well. They were probably the people who had no luck with earning much money, but said something like “money is not something you keep overnight” with a corky attitude. Of course, fishermen were not the only people lived in this area; many popular comedians such as Tounkaku Donpu, Minatoya Koagame, Naniwatei Seikichi, Arakawa Seimaru, Manriyu, Tsumakichi, etc. lived in the area as well. There were also some craftsmen. It was said that the town residents raised money to have Kago makers (basket makers) to make a town’s Mikoshi (portable shrine) for Daradara Festival of Shiba Shinmei Shrine. They spent 4,000 yen for this Mikoshi where the average cost of one Mikoshi was anywhere from 500 to 1,000 yen. I don’t want to speculate how they came up with that much money, but you can see the spirit of the town residents from this story. After the Great Kanto Earthquake (1923), the children around this area went to Takeshiba Elementary School first when the school was built, and then moved to Shinmei Elementary School after Shinmei school was established. Unfortunately, both schools no longer exist due to consolation of school districts, but some remains of the buildings are still there. Not many people would believe me now if I said the Hamamatsucho 2-chome area was known as “downtown”. However, there are still many people, who inherited the old-school spirit, live and run their businesses here. We also would like to pass down this “unique spirit of true Tokyo verve” to posterity.